(Photo: LWF)Antonio Guterres (L), U.N. secertary general designate, Lutheran World Federaton secretary general, Martin Junge, and LWF president, Munib Younan in conversation at the United Nations in Geneva in 2016. António Guterres who will become the United Nations secretary general in January is a former Portuguese prime minister who went into politics from a background of Catholic action. He has just served a 10-year stint as the U.N.'s High Commissioner for Refugees in a period which has witnessed one of the highest numbers of displaced people in history. The leaders of the three Protestant-dominated global church organizations are welcoming his appointment as they see he is a leader who is prepared to work with faith communities in dealing with the world. "This is good news for the UN and for all who need the UN to fulfill its important tasks in our time," wrote Geneva-based World Council of Churches general secretary Rev. Olav Fykse Tveit in an Oct. 21 letter to Guterres. "And I am certain that your strong commitment to engagement with the faith community, as demonstrated in the UNHCR High Commissioner's Dialogue on Faith and Protection, will continue to be a feature of your leadership of the United Nations," said Tveit. Guterres's strong Catholic faith has provided him with sustenance and a sense of social responsibility since his a childhood in northern Portugal village where he read from the pulpit as a boy, The Irish Times reported. While he was studying electronic engineering at university, he joined the Group of Light, a club for young Catholics. As prime minister, Guterres voted against liberalizing abortion in a referendum tabled by his own government in 1998. Abortion in Portugal was liberalized nine years later under a different Socialist administration. "I admire your courage, your clarity, and your true compassion with the suffering peoples in our world," said Tveit, a Norewgian Lutheran, speaking for the WCC, which represents a grouping of some 550 million Christians from mainly Anglican, Orthodox and Protestant traditions. He explained that the WCC has worked for justice and peace alongside and in frequent collaboration with the United Nations since the formation of the respective organizations. Tveit noted. "Through its Commission of the Churches on International Affairs, the WCC was one of the original non-governmental organizations in consultative relations with the United Nations, and contributed actively to the drafting of the U.N Declaration of Human Rights and to other foundational processes." 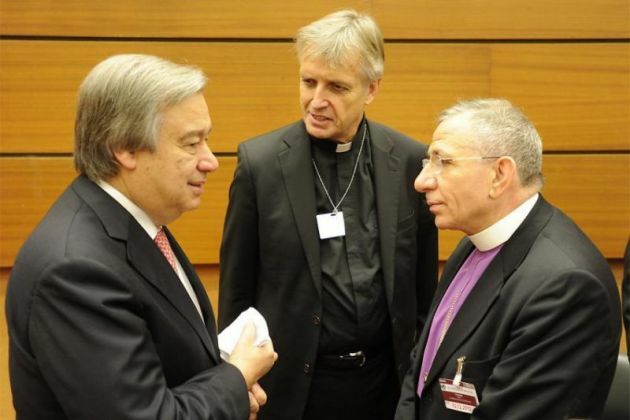 Bishop Efraim Tendero, secretary general of the New York based World Evangelical Alliance, which represents hundreds of millions of evangelical Christians, also sent a message to Guterres. "As people of faith, we appreciate how Mr. Guterres has acknowledged the critical role of faith-based organizations on issues such as the global refugee crisis, and we are committed to fulfilling our part in responding to the needs and challenges on a local, national, regional and global level," he said. "We are delighted to hear that a person with Mr. Guterres' competency, integrity and a heart for the most vulnerable will be serving the global community of Nations," said Tendero while stating the WEA's commitment to working with refugees. "It is a very challenging task that he has at hand, and we pray for God's blessing, wisdom and strength to be on him as he seeks to serve a hurting world." The president of the Lutheran World Federation, Bishop Munib Younan and its secretary general, Rev. Martin Junge, also wrote a congratulation letter to Guterres in which they referred to his faith. "In the High Commissioner's Dialogue, you spoke about how meaningful for you has been the Bible verse: to whom much is given, much is expected. "In your new role, as you well know, even more will be expected of you," the Lutheran leaders said. Guterres has become known for strong negotiating since he was elected prime minister in 1995 and he was able to run the country for one for four term with a minority government during his seven years in office.